Hi friends! Dana Tatar here today sharing how to assemble a wood photo holder using Self-Laminating Cards and vacation photos. There is something about the excitement of traveling that motivates me to take more (and better) pictures. I thought it would be fun to showcase some of my favorite travel pics on a small piece of art. I used a wood plaque that measures 3.5 x 5 inches for this project, the perfect size to sit on a desk or side table. 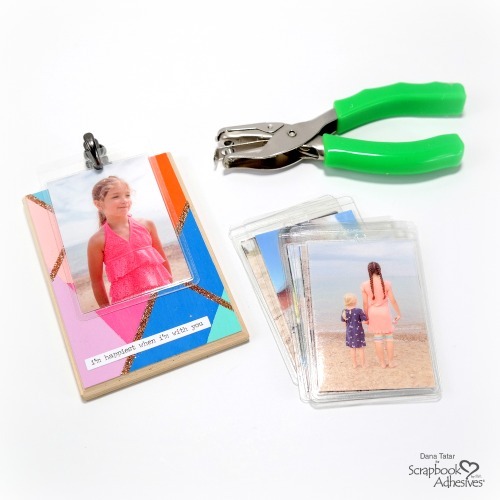 The Self-Laminating Cards are easy to rearrange on the clip hook to display another memory. Step 1: Use masking tape to cover portions of the wood plaque. 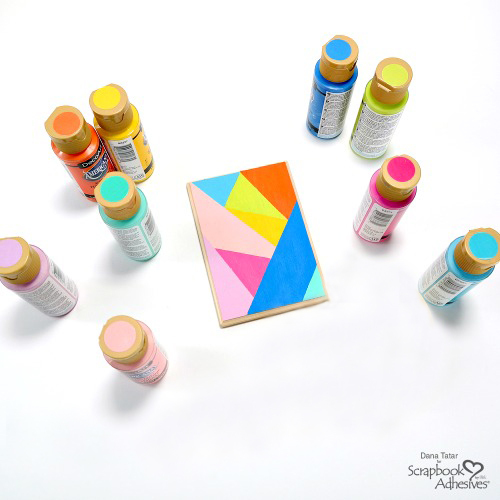 Apply bright colors of acrylic paint to the plaque in a geometric design, removing tape and masking areas as you work. Let dry. Step 2: Apply Extreme Double-Sided Tape along a painted line on the plaque. Remove the red liner and sprinkle with glitter. Repeat this process several times to add a touch of sparkle to the project. 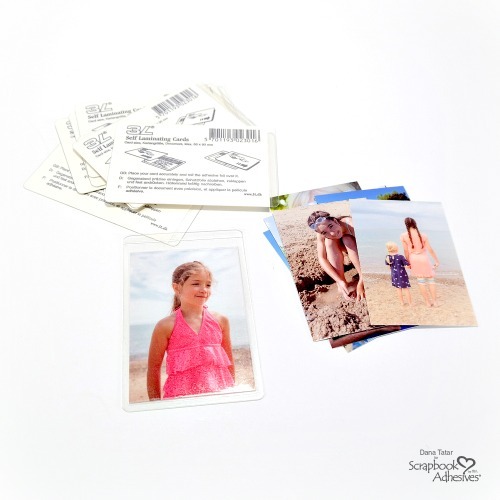 Step 3: Cut vacation photos to fit inside a Small Self-Laminating Card. Be sure to cut the photo slightly smaller than the dimensions of the card to ensure that the self-laminating edges seal. 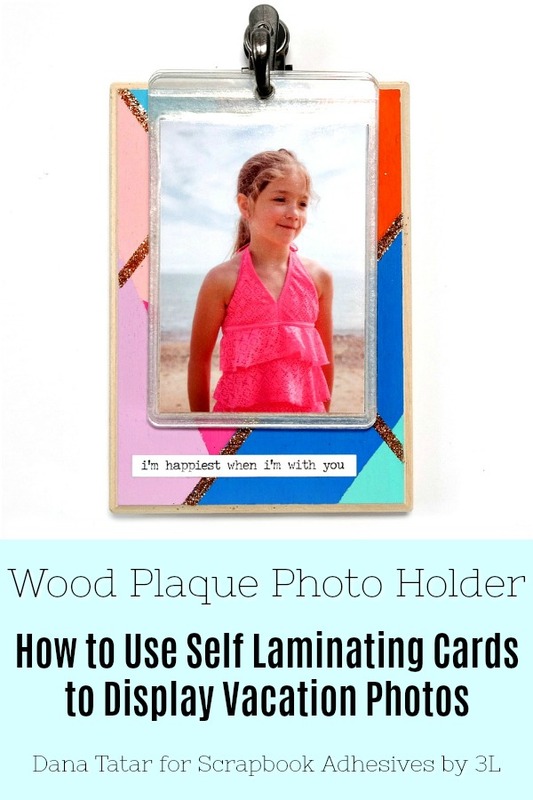 Place the photos inside the Self-Laminating Cards. Remove the liner and press the sides together to seal. Step 4: Punch a hole in the top of each card. 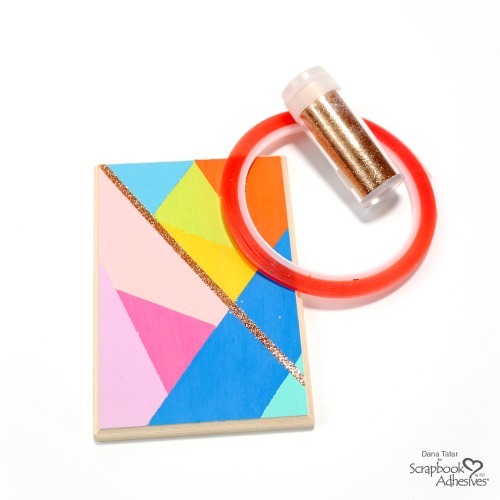 Place the cards onto a clip hook and attach to the painted board. Display and enjoy! Thanks for stopping by today! I hope I have inspired you to display some of your favorite photos. Extreme Double-Sided Tape 1/8 in. This entry was posted in 3D Projects, Adhesives, Altered Art, Beginner, Crafts & Tutorials, Extreme Double-Sided Tapes, Home Decor, HomeHobby by 3L, Mini Albums, Mixed Media, Permanent Adhesive, Seasonal Craft Ideas, Self-Laminating Cards, Skill Level, Spring, Summer, Tutorial, Wear your Adhesive on the Outside and tagged Dana Tatar, Extreme Double-Sided Tape 1/8", Home Decor, laminating photos, Photo, photo album, Self-Laminating Pouch Small, Tutorial, Vacation. Bookmark the permalink.